Hell Yeah! 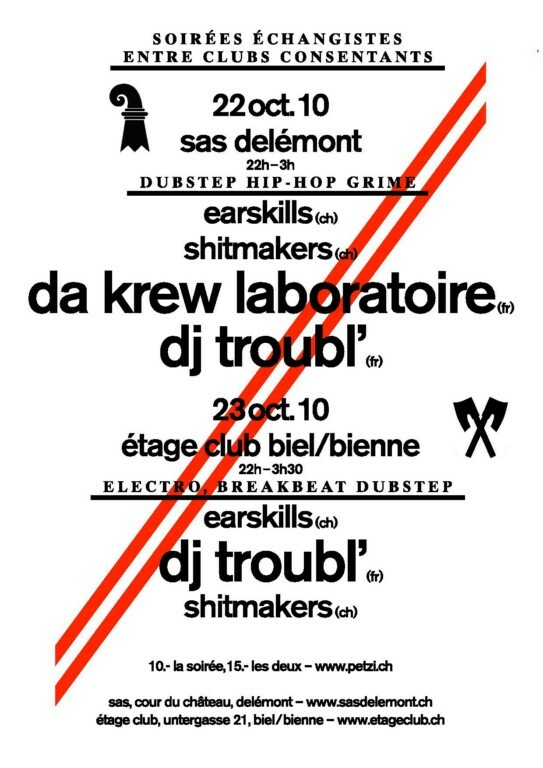 The Jura crew “Shitmakers” (aka Smees & Bool) and “Earskills” team (this time: D-Fonk, Ramburger & The Boyscout) are proud to announce the next parties in collaboration with the SAS-Club (Delémont) and the Etage-Club (Biel/Bienne) for one special week-end : “Soirée échangiste entre clubs consentants”! Prices: 10 frs for 1 party or 15frs for both! Print article This entry was posted by Boyscout on September 30, 2010 at 15:14, and is filed under Party. Follow any responses to this post through RSS 2.0. You can leave a response or trackback from your own site. exposure! Keep up the fantastic works guys I’ve added you guys to blogroll.